Speaking gets most of the press, but writing is a major part of learning a language. The benefits of writing while learning are majorly neglected, too. While writing, you have all the time in the world to think, correct yourself and polish your work. It’s a great flip side to the adrenaline of speaking! Not only that, but it’s one of the four major skills involved in becoming proficient in a language, along with speaking, reading and listening. Writing does come with its own challenges. However, it’s super easy to get started learning. So, you wanna get started writing in your target language? Well, let me tell you—there are plenty of exciting ways to do that! No need to limit yourself to classroom essays or textbook exercises, especially if those aren’t your cup of tea. Follow these tips, and soon you’ll be taking advantage of awesome online resources and interacting with native speakers in order to improve your writing skills! Ever wish you could get your attempts at writing corrected by native speakers? Well, with sites like Lang-8 and italki, you can! Thanks to amazing—and free—resources like these, you don’t need a tutor or teacher in real life to correct your compositions. Both of these sites allow you to write a journal entry in your target language, but with a social media twist. Sign up, make an account and get to writing! Native speakers will correct your grammar and vocabulary mistakes. Turnaround is fast, even for less commonly spoken languages. If you want a professional eye, italki is the ideal platform to hire a paid tutor. Lang-8 and italki are great resources in and of themselves, but we can make them even more effective for learning how to write clearly and correctly. This can mean very different things for different people, so don’t feel bad if your writing schedule looks different than someone else’s. For example, a busy person with a full-time job and kids might be able to write only a post or two on weekends. A student with a more flexible schedule might be able to write a post three times a week, or even every day. The key here is to be consistent. If you write on Saturday mornings, always write a post on Saturday morning. If you make the commitment to write every day, then stick with it. The consistency will pay off far more than binge writing every now and again. If remembering is an issue for you, try setting an alarm on your phone or computer to remind you to get those words in. You can also ask questions in the comments sections to clarify any confusing points you may have in mind. Each of these suggestions has different requirements for style, so you’ll probably end up learning more than you bargained for. Try not to fall back on writing diary entries on your daily life too often—those can be great, but they’re limiting in terms of style and content. Finally, make sure to practice the corrected words and phrases you get back with an SRS (Spaced Repetition System). SRS is a great tool for remembering vocab and grammar—it forces you to review concepts that you struggle with or that have faded into the background of your memory. For one, you can use the unique SRS built into FluentU by importing any bits of your writing that have been corrected online. 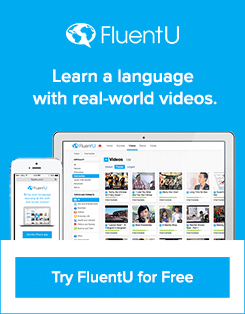 You’ll get to practice it using FluentU multimedia flashcards and interactive games, and you’ll even get to hear how those words, phrases or grammar patterns are used by natives in authentic videos from within the program. Alternatively, you can try out a more conventional flashcard app like Anki or you can write out your own cards by hand. To get the most out of your corrections here, enter the whole corrected sentence (in the target language) on the front of the card and your English/native language translation on the back. That way, you’ll be reminded of the correct grammar and word usage over and over. You thought forums were a thing of the early 2000s? Think again! In many circles, online forums are alive and well—and they’re a fantastic way to practice a new language. Find a forum focused on an interest of yours (a hobby, profession, game, sport, etc.) in your target language and have at it! There are tons of forums on every subject imaginable. For example, check out this French video game forum or this Spanish movie forum. You could even just participate in general question and answer forums—here’s Japanese Yahoo Answers! Simply Google “name of your hobby + forum” in your target language to see what’s out there. Forums are great places to get started interacting with native speakers. The low-pressure atmosphere combined with people who share your interests makes for a relaxing yet motivating learning experience. You’ll be interacting with folks outside of the world of language learning, which makes for more interesting conversation than you would find when just sticking to learning circles. To everyone else on the forum, you’re just another person who shares the same interest. However, this comes with a caveat—while you can ask for corrections, your fellow forum-goers may not be as enthusiastic about teaching the language. Just remember to be polite and say you’re learning! At first, depending on your level, you’ll want to start out posting short, simple responses. Lang-8 or italki are the places to practice long, flowery language. Here, just try to write without making too many mistakes—and this usually means sticking with what you know really well. As people respond and you get the hang of it, you’ll end up writing longer responses. By copying how other people write, you’ll learn plenty of slang words and casual sentence structures. This ain’t how your textbook teaches writing! Look up new vocab and familiarize yourself with terms about the subject matter of the forum. Another relic from the past, right? Again, a lot of places online still have chatrooms, and they’re often in the same online communities as these forums. Chatrooms are a wonderful way to see people “talk” in something close to real time. Participating in a chatroom is great for learning to think on your feet in preparation for speaking with natives. You can also download HelloTalk on your device to get your own personal chat going with a native speaker. Penpals bring with them even more benefits for learning to write. Find one on sites like Conversation Exchange where you can specify that you want to practice writing (email or snail mail) rather than live speaking. Penpals will correct you, just like the native speakers using other online resources, but it will be a much more personal interaction. On Lang-8 or italki , your post will be corrected by whoever finds it first. With a penpal, you get to know one person over time, and they’ll become familiar with the types of mistakes you’re prone to making. Once you get to know one another, you can comfortably ask questions—or ask for brutal honesty about your writing. And considering that this isn’t a social media experience, a good penpal will take the time to answer you! When you’re beginning your penpal search, try to find someone who’s just as committed as you are, someone who wants to practice English (or another language you speak natively) and is serious about writing regularly. When you find someone with similar goals, make a schedule so you’re always exchanging letters and emails! You’ll also have better luck in establishing a long-term friendship if you look for someone who shares something in common with you. Shared hobbies, profession, life stage—these can all provide subject matter to write about! Since these interactions are generally set up as language exchanges, your penpal probably wants to practice English or another language you know well. This is fine! Simply write your letters twice—once in your target language, once in the language your partner wants to practice. Ask your partner to do the same. This way, you get corrections on every letter, rather than taking turns writing in different languages. Finally, use your new friend for detailed info on grammar. They’ll be more able to tell you what “sounds right”—the kind of nuance that’s always elusive to the language learner! It’s this kind of detailed learning that’s difficult to do on a learning site or casual forum, so take advantage of your penpal’s insider knowledge! And, of course, provide them with the same helpful details on the language they want to practice, too! There’s a way to practice writing for every personality, so settle down and write something in your target language. After all, the only way to improve is to practice!